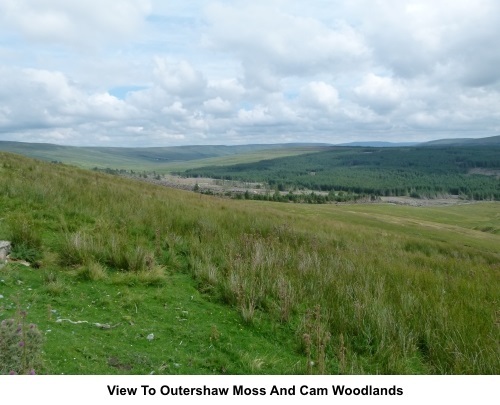 Introduction: I call this the Outershaw Round because it starts at Outershaw, it encircles Outershaw Moss and I could not think of anything else! It is quite a long walk at 13.5 miles but the going is easy, if a little muddy in places after rain. On such occasions, I would recommend gaiters. 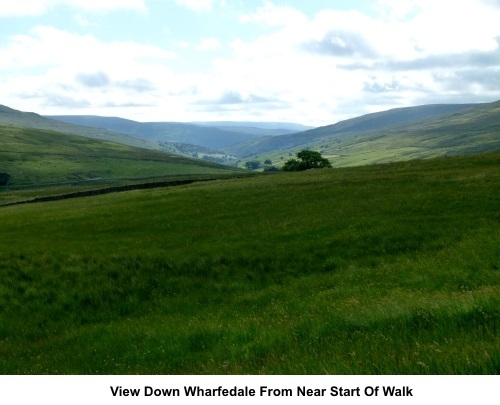 The walks follows well defines footpaths and tracks which include sections of the Pennine Way and Dalesway. As you might expect, there are plenty of fingerposts to guide you. 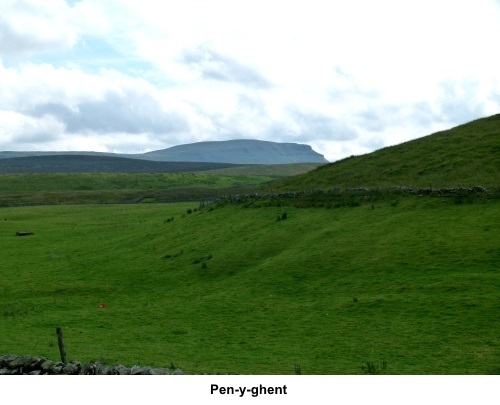 One section of the route follows the route of a Roman road, namely Cam High Road which ran from Ingleton to Bainbridge. Outershaw is a tiny, attractive hamlet by Outershaw Beck, which many think is a continuation of the River Wharfe. It isn’t! 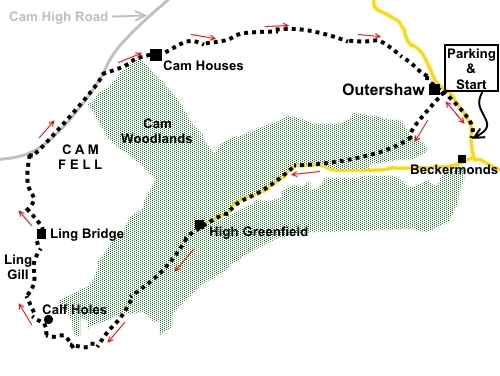 The Wharfe starts at the confluence of Outershaw Beck and Greenfield Beck, at Beckermonds. 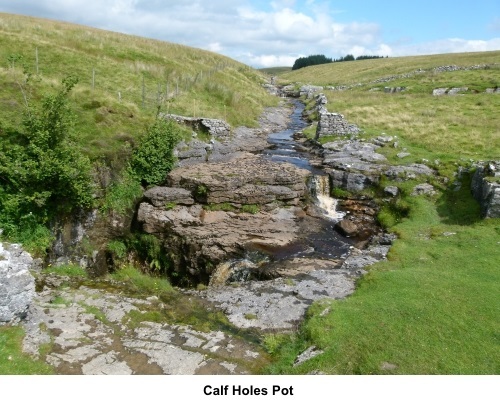 Features of interest en route are Calf Holes pot hole into which a stream cascades, Ling Gill, a limestone cleft in the ground and Ling Gill Bridge, a Grade II listed construction which was repaired in 1765 so presumably dates from some time before that. It has clearly had some TLC since then. 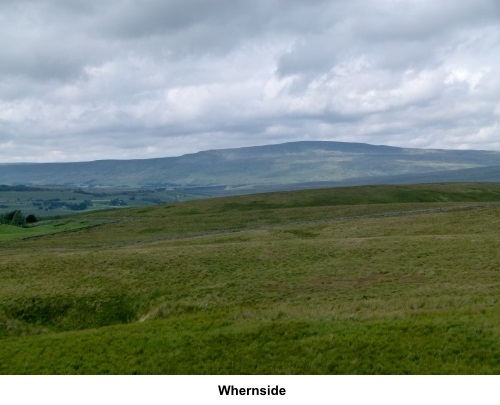 However, the thing I like best about this route is the wide panorama it offers with all of the three peaks (Pen-y-ghent, Ingleborough and Whernside) in a row. Unfortunately, the weather had started to close in on this occasion so the photos do not do it justice but you get an idea of what could be. The walk starts from an old quarry by the side of the road near Beckermonds. 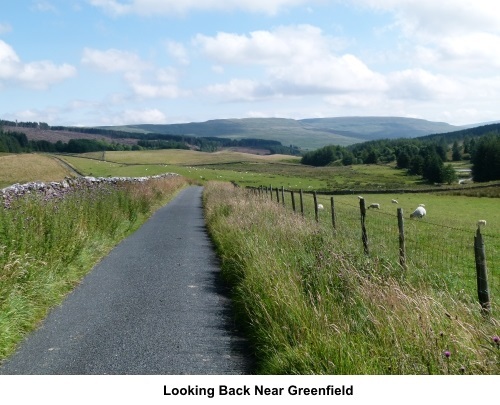 To get there from the south, it is a case of getting to Threshfield near Grassington, then following the B6160 to Buckden. At Buckden, fork left for Hubberholme. Follow the picturesque road alongside the River Wharfe, past Yockenthwaite and at the next fork, go right for Hawes. A quarter on a mile after the fork, the quarry is on the right. From Hawes, follow signs for Kettlewell. The quarry is on the left half a mile after the hamlet of Outershaw. There is actually some parking opposite an old chapel at Outershaw and indeed the walk proper starts from here. However there is a small notice at one end which indicates private parking so I err on the side of caution in starting at the quarry. There are no facilities en route but rocks by the beck at Ling Gill bridge make a good half way picnic spot. Start: From the quarry (SD 875807), turn right along the road for half a mile. Opposite an old chapel, turn left off the road to follow the fingerpost for “Low Greenfield 1 ½ miles” (SD 871815). Cross this first field on what is a fairly obvious path to a kissing gate beyond which you enter the plantation area. Follow the wide main forestry track. 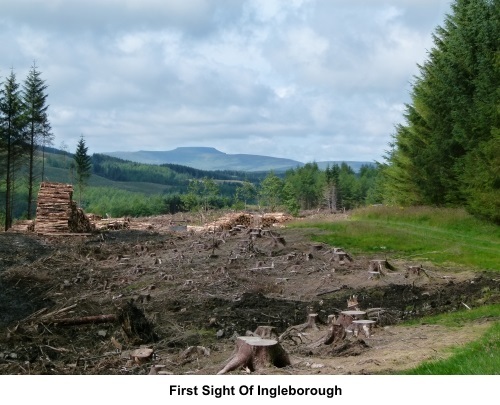 Just keep an eye open for forestry work and associated machinery because this is an actively managed plantation. Stay on this main track until it joins a tarmac lane (SD 851802). Turn right. You quickly come to the gate marked Low Greenfield. Pass through this and stay on the tarmac road to its end at High Greenfield. Here, the tarmac gives way to a rougher track. 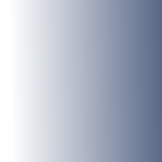 Continue along this in the direction of the fingerpost for “Byway/Restricted Byway, Horton 4¾ miles”. On meeting another broad track, go left, following the “Restricted Byway” fingerpost. Pass and ignore a broad track on the left at SD 818780. At SD 817778, the main track bends right into the plantation area but here, you need to turn off to the left of the track (almost straight on) following the footpath indicated by a yellow arrow and entering open countryside through a gate. 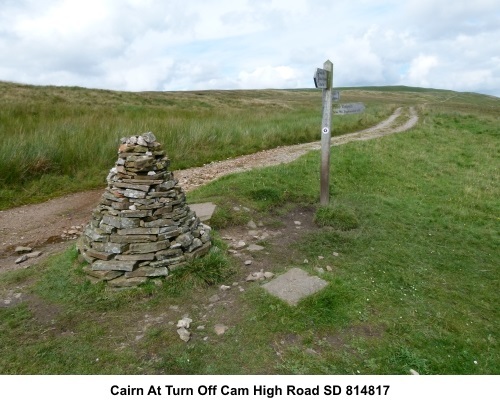 On reaching a three way fingerpost, turn right following the “Pennine Way” and “Old Ing ½ mile” (SD 813772). Go through a metal gate with a ruined barn on the left and stay on the main track. As this joins another broad track joining from your right, turn left. There is a fingerpost confirming you are on the Pennine way. To the left is the farm of Old Ing. Just past the farm is a three way fingerpost at a junction of tracks (SD 805774), turn right for Cam End. After about 200 yards there is a ladder stile on the right, over which is the dramatic sight of a waterfall cascading into the Calf Holes cave system (SD 804776). Take great care not to do the same! Stay on your original route and the next dramatic sight is Ling Gill, a limestone gorge on the left which is a nature reserve because it is a small upland woodland and the steepness of the gorge has prevented animals from grazing the plants. Public access is not encouraged and it cannot be accessed from this route. I was amused by the instruction on one of the signs which said to “Please see the back of the sign for further important information”. Given its proximity to the edge of the gorge, I can only say “at your own risk”!! 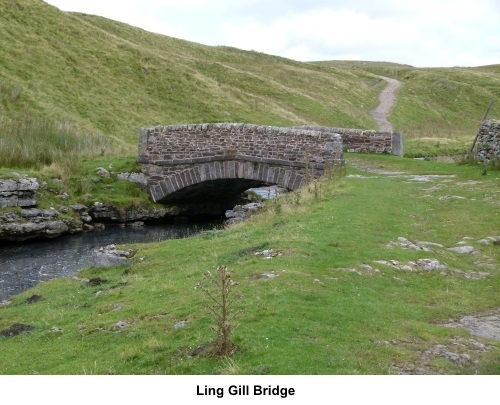 Beyond Ling Gill is Ling Gill bridge (SD 803789) which, according to the embedded ancient stone, “Anno. 1765.This bridge was repaired at the charge of the whole West Riding”. There are some useful rocks by the beck for a picnic. Cross the bridge and turn right on the broad track. About a mile beyond the bridge, at a ‘T’ junction of tracks, turn right following the fingerpost for “Pennine Way, Pennine Bridleway” and “Dalesway”. You are now following the course of a Roman road. 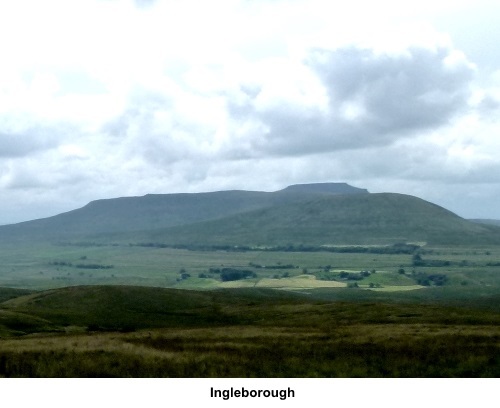 Along here, looking back, is a great panorama which incorporates all the Three Peaks of (left to right) Pen-y-ghent, Ingleborough and Whernside. When the track forks, go left through a gate. Continue to follow the track until you reach a large stone cairn. Turn right here to follow the fingerpost for “Dalesway” and “Outershaw 3¾ miles” (SD 814817). The path drops down to a broad track. Go straight over this to follow a public footpath fingerpost. The path drops down to Cam Houses. Pass through a couple of gates and follow the Dalesway fingerposts through the buildings. Just before the last building, turn right then left. The remainder of the route is straightforward, coming out on the road at the north end of Outershaw. Follow the road back to the car parking.